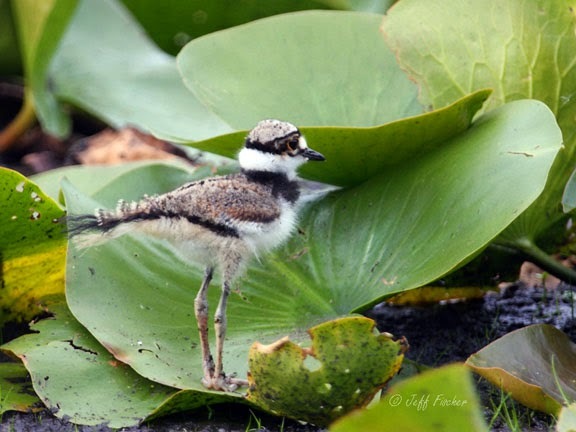 The killdeer is a common plover found throughout North America, Central America and Northern South America. They typically nest in the United States, Canada, and Mexico. Birds that nest in Canada and the northern US typically migrate as far south as Peru. Birds that nest in the southern and central US often are year round residents. Killdeer are ground nesters. The nest is a shallow depression in dry ground with little vegetation around. The bird above is on the nest and actually has chicks below her as well as the one visible out front. 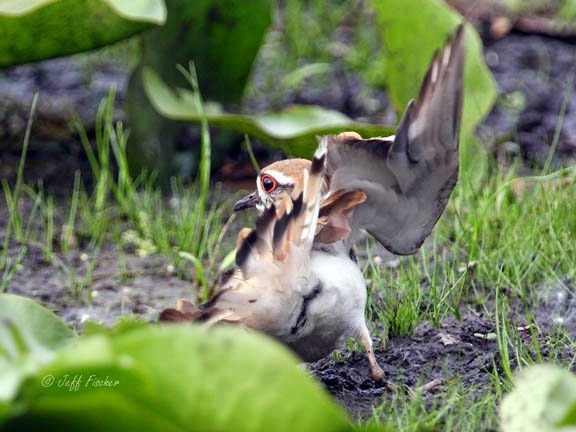 Killdeer will sometimes nest in wetlands finding a slightly elevated dry spot for the nest. 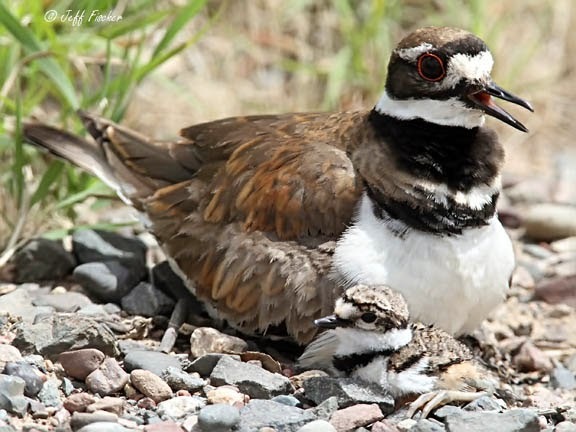 They have also been observed nesting on the gravel roofs of buildings, which can be disastrous.The typical clutch size for killdeer is four to six eggs. The eggs are incubated for three to four weeks. The eggs are buff colored with many speckles which makes them look like stones. When the chicks hatch they already have a covering of down feathers and are able to leave the nest and begin foraging right away. Even though this chick was way to young to fly it still could run quite quickly and was an expert at hiding in the lily pads. Although they are a shore bird killdeer are often found away from water in parks, farm fields, golf courses and along gravel roads. When a predator shows up near the nest or young the adult bird will often fake a wing injuring to try to lure the predator away. When the predator is far enough away from the nest or young or if it gets to close the adult will give up the rouse and fly away. This does not stop animals like cows that are not interested in eating the adult. In these cases the bird will puff itself up as large as possible and charge the larger animal, hoping to get it to change its path. The bird in the photo above is faking a broken wing. Aww... The picture with the chicks is the best. What a treat t get to watch that family. I saw some in Washington last month for the first time. They are an interesting little shorebird. So it's not a kill deer, it's a fool deer to go away? HI Lovely shots and information about this little wader, Beautiful butterfly on last post also. What a sight it must be to see that little chick skittering over the lily pads. Plovers are lovely birds. the chick looks so cute on the lilypad!